If you like to save money, raise your hand. If you aren't a very organized person and/or you'd like to learn a few extra tips on how you might save money in your household, raise your hand. If you've raised your hand, chances are that you'l find Saving Savvy: Smart and Easy Ways to Cut Your Spending in Half and Raise Your Standard of Living...and Giving a rather interesting read. That's not to say I didn't learn anything from her because I did. She had some tips for freezing peppers and other vegetables that I found rather helpful. She also gave some helpful tips for purchasing pantry goods in season that I found to be rather helpful. She does have ideas that had just never crossed my mind before and so it was interesting to breeze through this book and glean some new tips and tricks to continue saving money for our family. "This book is a gold mine of practical, how-to advice taken straight from God and Grandma's way of handling money." There you have it. God and Grandma. I'm also very annoyed because some of the scriptures that are listed in this book are taken completely out of context which really drove me nuts as I was reading along. While there are plenty of scriptures that talk about how to spend and care for money wisely, I think she took certain verses a bit too far when trying to instruct the reader on how to save. I eventually stopped looking at her quotes and scriptures because they were more distracting due to their inaccurate application than anything else. Stick with the idea that she's practical and that should be enough. You're chances of gleaning a thing or two from this read are rather high although I do think there are certain parts of it that are best ignored. On that note . . .
Worthy Publishing has offered to give away one copy of Saving Savvy to one of you. This contest is open to US AND Canadian residents and will be open through Tuesday, November 8th. To win? Simply leave a comment below along with a valid e-mail address. Thanks to PR by the Book for shooting a copy of this book my way and to Worthy Publishing for offering the giveaway! 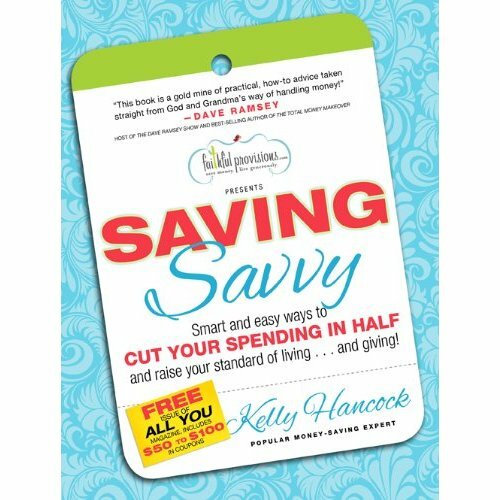 I love the topic of saving money, and would enjoy reading this book. I was just saying to my mom that I want to read a good book on this subject, but our small library only carries a couple titles and I've read them already. Hmmm, mixed review, but I wouldn't mind reading it myself. :) I get a little too comfortable and need challenged. . . I might read this, thanks! I would be interested in reading this book. I feel like we've come a long way in the last few years with actually knowing where our money goes and being more budget conscious. N even got me to grocery shop once a month (he helps). I fussed and fumed the whole way but for us it works. Count me in! I love saving money and reading about money saving...even if it is a lot of lists! Thanks, Carrie. I would definitely like to learn a few extra tips on how to save money! Thanks for the giveaway! Sounds interesting! As someone who resists budgets because I feel they stifle generosity and highlight independence (versus God-dependence), I'm interested to see what the author's take is on this. I'm all for spending less money on household needs. The hubby and I are desperately trying to save for a down payment on a house, and it's HARD! As a mom to three boys I would love the opportunity to win this book and find out family-friendly saving tips!!! We used to be really good with our money. But something happened this year and we've been spending like crazy. We're still within our means - just not saving like crazy. So we had a "money talk" this weekend. Starting in January we're going back on a strict budget. Partly because we have a goal of Joel working from home one day. To do that we need to live on much less. So our goal for 2012 is to live on 2/3 of our gross income. Discipline is always good for us, right?